Ayesha Mian at Hyatt House for Charlotte NACE's "My Big Fat Indian Wedding". Live Event Painting. 16x20. Watercolor on Paper. I frequently travel to Charlotte for photography assignments. This year I have photographed corporate events in Charlotte and also photographed an Indian wedding in Rock Hill SC (right outside of Charlotte). And I will be back in Charlotte to photograph another Indian wedding at the Ballentyne Resort. 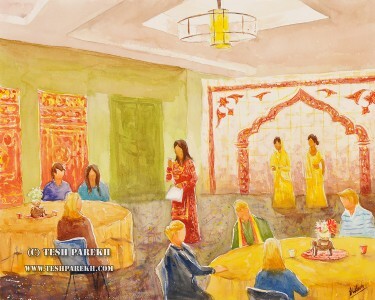 So, it was fitting to paint live at Charlotte NACE’s “My Big Fat Indian Wedding”! As a professional photographer, I often photograph multi-day Indian weddings. The event was Charlotte NACE’s monthly meeting at the Hyatt House. 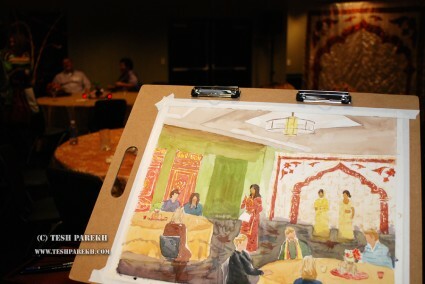 Ayesha had decorated the banquet room for this event. The food was catered by the Bombay Grille. This was a fun and educational event. Ayesha talked about various Indian wedding customs and explained many of the traditional terms. Her team participated in the event as well. There were also dance performances. Ayesha also answered many questions from NACE members. I did this painting as a watercolor due to the short duration of the event. I kept the painting size at 16×20. I enjoyed talking to many NACE members as I painted. Mica had travelled with me for this event. We gave away 2 prints of this painting. I finished most of the painting on the location. But, due to the time-constraint, I applied finishing touches back in my studio. I will be producing the prints and look forward to sharing those with the NACE members. Below is my setup before I started the painting. I sketched the background first and then laid some of the initial washes. Since part of the event was by the pool outside, I had to wait before sketching in event guests. 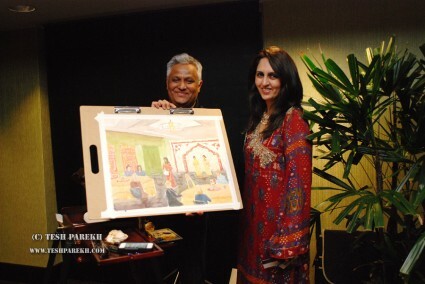 When Ayesha made her presentation, I sketched her directly on the painting. Normally, I make reference sketches. But, I had to work differently here because of the schedule. The rest was easy. Almost, easy! Working in the full color and completing many of the details. Live event painting in progress. The light has changed! Here I am with Ayesha. I enjoyed meeting Ayesha and her husband (glad to meet another husband & wife team!). I look forward to working with her at weddings and events. April was a busy month for live paintings! I did a live wedding painting commission in Chapel Hill (previous post) and also did another live event painting at a Stacie Francombe and Preston Bailey event in Durham NC. I will be posting that painting next. I have several inquiries for both live wedding paintings and live event paintings. I am hoping to get some more commissions. I also paint from reference photos. Ayesha Mian at Hyatt House for Charlotte NACE’s “My Big Fat Indian Wedding”. 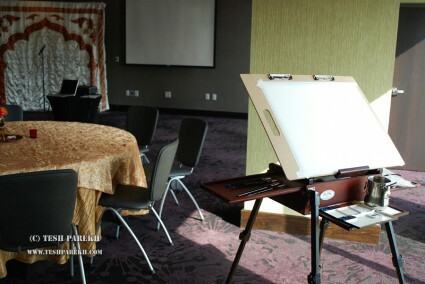 Live Event Painting. 16×20. Watercolor on Paper. Did you like this entry? Here are a few more posts that might be interesting for you. Please contact to purchase poster!